Hardly. Conyers made a career out of race-focused politics. Leaving the current sexual harassment witch hunt and his wife’s bribery conviction out of the discussion, fifty years is enough. Over 90% of representatives and over 80% of senators were re-elected in 2008. Far from being a sign that Americans are pleased with the job they are doing – a voters’ dislike for both houses of Congress is extremely high at the moment – this statistic demonstrate the thesis of this article, that mandatory term limits are needed to restore representative government and ensure accountability. We need folks coming in from the outside who have paid taxes and created jobs and lived under the regulations that these career politicians have created," said Jim Rutledge, a Republican attorney running to unseat Maryland Democratic Sen. Barbara Mikulski, who has 33 years in Congress between the House and Senate. Rutledge is right. Ms. Mikulski is clearly a career politician, a breed that our Founding Fathers had no use for. Nor should we. The trappings of power and authority were meant to be shared in this republic, not closely held for decades by a governing elite. "The powers of incumbency in this country are so great that it is nearly impossible to unseat an incumbent, barring death, indictment, scandal or retirement," said Philip Blumel, a Florida financial planner and president of the advocacy group U.S. Term Limits. Indeed, the contrast between our approval of Congress and our ability to replace wayward members makes the unfair advantage incumbents enjoy crystal clear. Curtis Gans, the director of the Center for the Study of the American Electorate at American University, said term limits are a terrible idea because they take power away from the people. In a term-limited legislature, Gans said, power would fall to unelected staff and lobbyists who would keep their jobs while elected officials rotated out. Term limits would also restrict people with the most experience and ability from serving in Congress and would contribute to the election of extreme, polarizing candidates, Gans said. I recently had the chance to briefly discuss the issue with Republican Congressman John Culberson of Texas and it should come as no surprise that he was against term limits. His logic, like that of Gans, was that he was just now getting some seniority and leverage over the machinations that make Congress go. I find this logic extremely self-serving. First, governing is not so complex that a new congressman cannot figure it out. The process itself is undoubtedly a maze that would have to be simplified to accommodate new members of the body. This, like the fresh blood terms limits would inject, would only help matters. Perhaps then Congress could read the bills it passes. Second, under a term-limited system, seniority would be gained and lost more quickly, ensuring that no one hand was on the controls for too long. Clearly that’s not the case now, something the opacity of the health care debate and its many backroom deals only served to bring to the attention of Americans everywhere. This November, first demand new representation and then force them to accept the will of the people by implementing term limits on both houses of Congress. That’s one decision you’ll never regret, I promise. 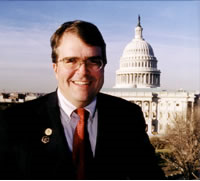 I recently had about ninety seconds alone with Congressman John Culberson, the Republican representative from Texas district 7, which includes the west Houston area, and used the opportunity to ask him about congressional term limits. “What do you stay to those who believe that term limits are necessary to restore representative government to our republic?” I asked. Culberson, who had just wrapped up an impromptu meet-and-greet with a friendly crowd at the Houston tea party, initially responded by saying that he was just now getting into a strong position within the house committees on which he serves. But before completing that argument he changed tacks, saying that term limits can have negative effects, and pointed out that Houston lost Bob Lanier, a very popular mayor, to term limits in 1998 after just 8 years in office. That’s not strictly true, of course, since sitting members of Congress are rarely faced with tough challenges in their party’s primary. 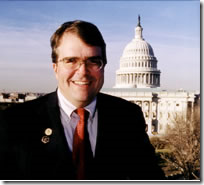 When I pointed out that Republican voters in his district – which is not my own, I should add – effectively have no choice because voting Democratic isn’t a viable alternative for most of them, Culberson stuck to his talking point, repeating the every-two-years line again before adding that advocates of small government and local authority have no better friend in Congress than him. This last is quite possible as Culberson’s voting record is very conservative. He has a 96.7 rating at the American Conservative Union, a leading tracker of voting records on conservative issues. I thanked him for him and we parted ways, both of us probably a little confused at the encounter, him because of questions that must have seemed out of context at the conservative protest and me because if a small-government, self-described Jeffersonian doesn’t value turnover in government I had to wonder who would. As I noted previously, sentiment for term limits was luke-warm at best. Discussing the interview off-line with a reader, the response I got was that when/if a high quality representative was found that the district needed to hang onto him/her because there aren’t that many good choices out there. Personally I don’t buy that argument now any more than I ever have. Being a good representative is about intelligence, character, and knowing right from wrong. Skill at making back room deals, horse trades, and the quid pro quo of modern politics is nothing to be desired. Rather, these are symptoms of a system of governmental careerists, the very thing deemed undesirable by the Founding Fathers. For instance, you cannot tell me with a straight face that there is no suitable replacement for John Murtha anywhere in his district. That simply is not true. Yet he’s served 35 years in Congress, most of them after being caught up in the Abscam scandal. To most unbiased observers – and even some who are – it’s clear that the political culture in Washington D.C. needs changing. How that is ever supposed to happen when the same players continue to jockey for position after every election is a mystery. My consternation continues unabated. What’s needed is obvious. Who will make it happen is another question entirely. How Old is Too Old for Public Service? An average adult would not trust Sen. Robert Byrd (who is 91) to pet-sit their mutt for fear that the unfortunate creature might accidentally turn up in chili con carne. Yet, Byrd sits on the powerful Senate Appropriations Committee, where he doles out massive amounts of taxpayer funds for West Virginia landmarks with "Byrd" in the title. It’s a question that needs to be asked, particularly in conjunction with the issue of term limits, and it deserves a serious answer rather than boilerplate P.C. nonsense about ageism. How old is too old? It depends. But there comes a point in time after which wisdom turns to dotage and public service should be ended before the decline begins. Unfortunately, the current party and power system doesn’t readily allow over-the-hill incumbents like Byrd, Stevens, and Dingell to be replaced without their consent. Part of wisdom is knowing when to quit. We see the proof of this all time time in the world of sports. Michael Jordan knew when to leave the game behind; Evander Holyfield still doesn’t know that he’s been done for 5+ years. It’s the same way with political heroes too. The difference is that Supreme Court justices and senators who linger in their fiefdoms do more than tarnish their personal legacies. Great damage can be done to the country by their refusal to make way for new, more capable leadership. A mandatory age limit is too general because it disqualifies perfectly fit candidates from holding important positions. But as Byrd’s tenure demonstrates, a limit of some kind is needed. Again and again I return to term limits as a tool to resolve conflicts such as this. Somehow we need to make them reality. Thanks to the wisdom of Alaska’s voters, our second term-limits poster boy and convicted felon Ted Stevens will apparently be returning to the senate to start this fall’s lame-duck session. Stevens has held the office since 1968, making him the 7th longest-serving senator at the moment. One can only guess at what the state’s voters were thinking. Hopefully they were looking ahead to Stevens’ likely departure – which is likely to happen soon with fellow Republican Jim DeMint pushing for his expulsion – and voting to ensure a Republican replacement. Then again, perhaps Stevens’ survival is not the voters’ fault at all. Despite excellent voter turnout in the rest of the nation and Sarah Palin’s presence on the ticket, voting numbers are actually down in Alaska for 2008, strange as it may seem. Congressman John Murtha recently shot himself in the foot by calling his own constituents “racist” and “rednecks” while campaigning for Barack Obama in Pennsylvania. Despite being one of Congress’ Princes of Pork and his rather dismal view of his state’s citizens, NBC is now projecting that Murtha will retain his seat in the House of Representatives. Murtha is a veritable poster boy for term limits. What has been a bad night for Republicans just got worse with this presumptive Murtha win. The Senate Republican leader, facing an unexpectedly tough re-election race, tells diners that his stature and seniority bring dollars-and-cents benefits to the area: $2 million for a job training center, $720,000 to a historic preservation group, $1 million for sewer lines. The flow of federal cash to Kentucky will slow to a trickle, McConnell says, unless voters pick him for a fifth six-year term. “Your senator, the guy you’re looking at, delivered $500 million for the commonwealth,” McConnell says. Charming. Far from being a fiscal conservative McConnell’s record on spending represents a lot of what has been wrong with the Bush administration’s budget policies. I suppose we should all be grateful that the Democrats did not achieve the super-majority in the Senate they’d dreamed of, and yet, 24 years of Mitch McConnell would have been enough. The NY Times says that the New York City Council has changed the city’s term limits law to allow Mayor Michael Bloomberg to seek – and undoubtedly win – a third term. After a spirited, emotional and at times raucous debate, the New York City Council voted, 29 to 22, on Thursday afternoon to extend term limits, allowing Mayor Michael R. Bloomberg to seek re-election next year and undoing the result of two voter referendums that had imposed a limit of two four-year terms. In other words, the city council decided to reject NYC voters’ demand for changes in leadership. Hopefully they will be punished at ballot box for their unrepresentative, unwise vote today. Another way to get some fresh blood and increased accountability back into Washington would be to implement term limits. Frankly speaking there’s no good reason for people like Joe Biden or Trent Lott to make a life’s work out of sitting in Congress. Serving so close to the center of power corrupts people and we need to be protected from them. Given the incumbent advantage, the simplest way to realize this goal is for their departure to be made mandatory. The argument that experience is required to fulfill one’s responsibilities in Washington is fallacious. Oh, it’s true enough given the effectively lifetime reigns of Robert Byrd and Strom Thurmond, both of whom went senile while sitting in the Senate. Remove these permanent fixtures and a more meritorious mechanism for distributing power will quickly surface. There’s no justification to the argument that the quality of government would suffer if term limits were implemented. Seriously, Congress has what, a 10% approval rating – how much worse could it get? America’s two-party system provides an unfortunate advantage to the well-connected when it comes to getting elected and a head start when it comes to staying in office. By the time the voters are involved it’s often too late to make a difference, particularly if the incumbent is of your party’s affiliation. What choice does one have in that situation come November? Zip. The best way to improve the health of our government is to have new blood pumped into the patient and to do that we may have to bleed some of the bad stuff out. Why not go easy on the leeches and use term limits instead? The American political system is a drag at times like these, when one is about to become disenfranchised in Washington. Barack Obama will have an all-Democrat, all-the-time Congress to work with and, unlike the Republicans’ little train wreck this far this century, they’re probably going to get a lot of their agenda made into law. The problem with the result, aside from the obvious liberal, neo-socialist outcome, is that it’s driven by the party system, a corrupt, artificial channeling of votes into pork-laden, least-common-denominator policies preferred by the powerful. Where can a true maverick fit into our current system now that the national party bosses have a stranglehold on the electoral process all the way down to the local level? In fact, the 2 major parties completely dominate politics at the highest level to the extent that 3rd party candidates are completely excluded from the presidential debate process. It’s effectively impossible for anyone not willing to kow-tow to one of the parties to become the leader of this nation. That’s bad because the best thing that could happen to Washington D.C. is for a true outsider to be elected president with a mandate to whip their sorry rear ends into shape. Wouldn’t Sarah Palin be great in that role? She’s not the best person to lead the U.S., particularly with the financial and international issues that we’re facing, but a Palin presidency could result in the bursting of a ego-bubbles on Capitol Hill. Sadly, that’s not going to happen for at least a few more years. Washington’s complexity is in large part due to the entrenched powers that are protected by the very complexity that rejects outside interference. Representatives whose terms are limited have no need to protect their positions – there’s nothing to protect. The natural response would be to create streamlined systems so that actual work can be accomplished in the little time an elected official has in office. Sneaking term limits past the U.S. Congress and into law would be akin to pulling a Radio Flyer wagon up to Fort Knox and asking for it to be filled up with gold bullion. Not going to happen unless there’s a truly special individual willing to make change happen no matter what. One characteristic of this person would be a fundamental belief that he/she should do what is right at all times, regardless of party affiliation. The two-party system rejects these people automatically, but occasionally one will slip through. A real agent of change always votes his conscience and that cannot be allowed in the 2-party system. Real rebels are not wanted here. I’ll be voting against Chet Edwards, the Democratic representative from Texas, this fall. As Chuck points out, he’s somewhat out of touch with his constituency in a very conservative district, and he’s been in office for too long as it is. But one thing that can be said is that Edwards at least pays lip service to a fundamentally important idea: voting one’s conscience. Edwards said any action he takes in Congress is guided by independence and reason, rather than by partisan politics. Chuck sees this as a problem but I disagree. Voting one’s conscience is essential in a representative. Assuming that’s what Edwards has done, his beliefs are out of step with the people in his district, as Chuck says. But the solution is for the voters to elect new representation, not for Edwards to vote per polls instead of his own values. Barack Obama claims to be this change agent that’s needed in Washington. Though his record indicates otherwise there is always a chance that once he’s elected he could turn on the Democratic party that shepherded him into power and rule, as Edwards says, according to his independent judgment and reason. Lipstick-covered pigs could fly, too. Our best chance at revitalizing the democratic process in this country is to pursue a Constitutional amendment to limit the terms of the House and Senate as the presidency is limited. Not only would this churn the waters in Washington but it would have the effect of aerating the parties themselves by forcibly injecting new personalities and values into the parties themselves. While not as optimal as having a viable 3rd party option to vote for, change within the existing parties would certainly benefit Americans by making elected service a job with limited longevity. The L.A. Times reports that only five of the 153 races in the recent election were true contests. Read the story. Since politicians seem to have adopted gerrymandering as a means of preserving their jobs, there’s only one way to get them out of office: term limits. Incumbents hate term limits, which is nearly enough to recommend them on that point alone. Their argument: their dismissal would lower the quality of government. Hah! If anything, regular, forced turnover would raise the bar considerably by infusing stale government committees with new blood. The city of Houston has terms limits and its quality of service has not declined. The fact is that there are far more Americans qualified and capable of leading than there are positions to fill. Every country should be so lucky. The only reason to oppose term limits is a love of the corrupt, insider’s game that currently dominates the republican process.